After the disappointment of missing the close pass of Jupiter during the third orbit of Juno because of an epic snow storm at Mauna Kea, we finally lucked out with the weather and were able to observe Jupiter’s southern aurora with IRTF at the same time as Juno! On the 2nd of Feb 2017 Juno completed it’s 4th orbit of Jupiter with a perijove or closest approach of only ~4300 km! If you imagine Jupiter is the size of a basket ball then Juno was only one finger’s width away from the top of Jupiter’s dense atmosphere! Just after Juno made its closest approach, it passed through the magnetic field lines which are connected to the southern pole. At the same time as Juno was passing through these field lines and taking its data, we were observing the southern light of Jupiter using the new instrument iSHELL at IRTF. Before we could start observing, the instruments needed to be changed. The previous observer, who is also a ground-based support observer for the Juno mission, had been using another instrument called SpeX. They were looking at a slightly different wavelength and interested in taking images rather than splitting up the wavelengths and taking spectra, which is what we’re really interested in. We started off by doing our calibrations and taking a star spectra, the usual procedure, which gives us useful data to use later in our data reduction. In January iSHELL was taken off the telescope and a new filter was added to the guiding camera which means we can take an image of Jupiter’s H3+ emission which is FUN! We didn’t have that option before as NSF cam had blown itself up and CSHELL didn’t have a H3+ filter, so this was exciting! Henrik had used it before and was able to show me the ropes, but wasn’t straight forward, and it was a bit tricky to get a nice image but we managed to figure it out! To keep the telescope pointing at the right palce, we needed to guide on Jupiter. Our support astronomer and another observer had told us about a new technique they had developed for guiding the telescope. In the past we’ve relied on having a star to guide on, which keeps the telescope steadily tracking Jupiter across the sky. This doesn’t work when you’re observing Jupiter in the day time or can’t find a guide star. Our observations started off at 03:00 Hawaii time, which is most certainly night time, but since we knew we’d be finishing up in day time, we decided to bite the bullet and practise using the new guiding technique. So first off we tried guiding on the aurora itself, which meant drawing a box around the aurora and using the guiding program to track it. But it didn’t really work out, we don’t really know why but it might have something to with it being our first attempt. Then we changed wavelength, took another image and searched for a spot to guide on. We tried out a few spots but they weren’t bright enough so we found the most famous of spots on Jupiter, the Great Red Spot! This worked really well and so we set off a macro scanning the southern aurora of Jupiter while guiding on the Great Red Spot. We managed to take several complete scans of Jupiter’s southern aurora, which I was super happy with. This was the first time we’d succesfully used our macros in combination with this new guiding technique! 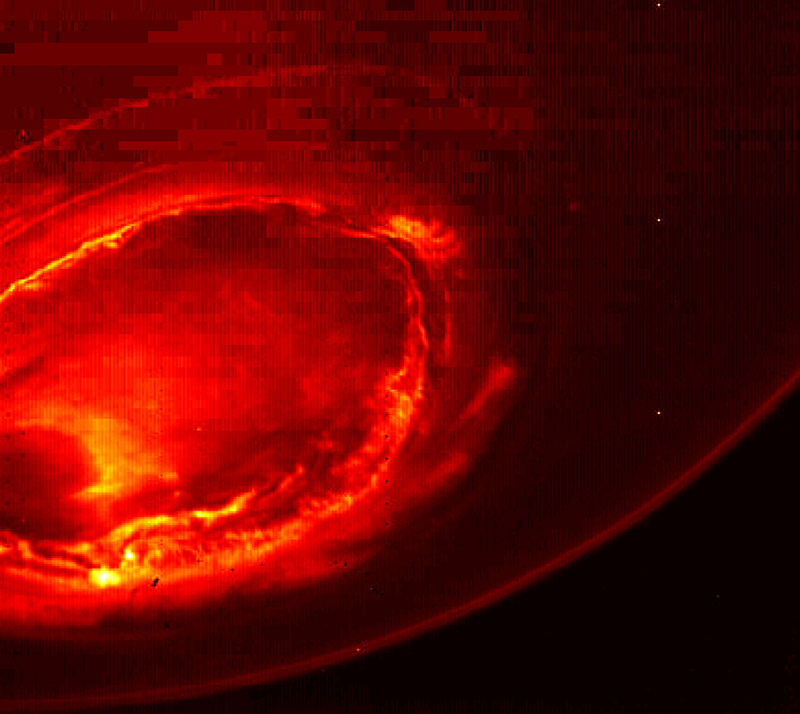 While we were observing with IRTF, Juno was taking images in the infrared of the southern aurora, similar to the image below which was taken during its first orbit. I cannot wait to see the new images of Jupiter’s asouther lights and compare them to our data! As Jupiter’s rotational axis and magentic axis are not aligned the aurora are offset slightly and do not encompass the rotational poles. This means you can only observe the northern or southern aurora for a certain amount of time before they rotate out of view. So after a couple of hours observing the souther aurora, it had nearly rotated our of view and we decided to check out the northern aurora. But of course you can’t have it all and just as we were about to start taking observations of the northern aurora, Jupiter promptly dissappeared behind the clouds! Although this was disappointing it wasn’t the end of the world as we were to first people to observe H3+ in the southern aurora of Jupiter, which is pretty neat! As well as being simultaneous with Juno we were also observing at the same time as astronomers using the Hubble Space Telescope to observe Jupiter southern aurora in the Ultraviolet wavelengths. This is super exciting! Lots of potential for future fun science times! Next up we have PJ5 on the 27th of March we have perijove 5! We’ll be observing again with IRTF and iSHELL around the time of Juno’s closest approach to Jupiter. Weather permitting we’ll be looking to observe the Northern aurora at the same time as Juno, and I’m excited to test out the macro to scan the northern aurora!